Multi-barrel assemblies are manufactured mostly from borosilicate glass capillary tubes. The appropriate number of tubes are fused or glued together before pulling. The two ends of this electrode ‘blank’ are then held by chucks of the puller and a heating coil is used to soften gently the glass in the central portion. One of the chucks is then rotated while the electrode blank is pulled slowly. This rotation and pulling bring about the lengths of glass tubes to fuse together. 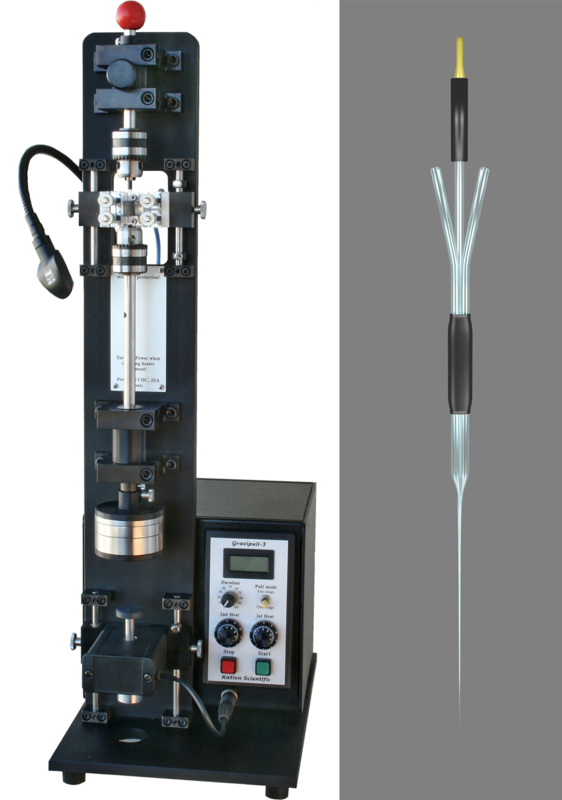 The combination of current supplies to the heating coil and the degree and timing of pull may be varied to produce pipettes of different lengths and diameters. The open ends of the capillary tubes are splayed to facilitate access and to prevent cross-contamination when filling. 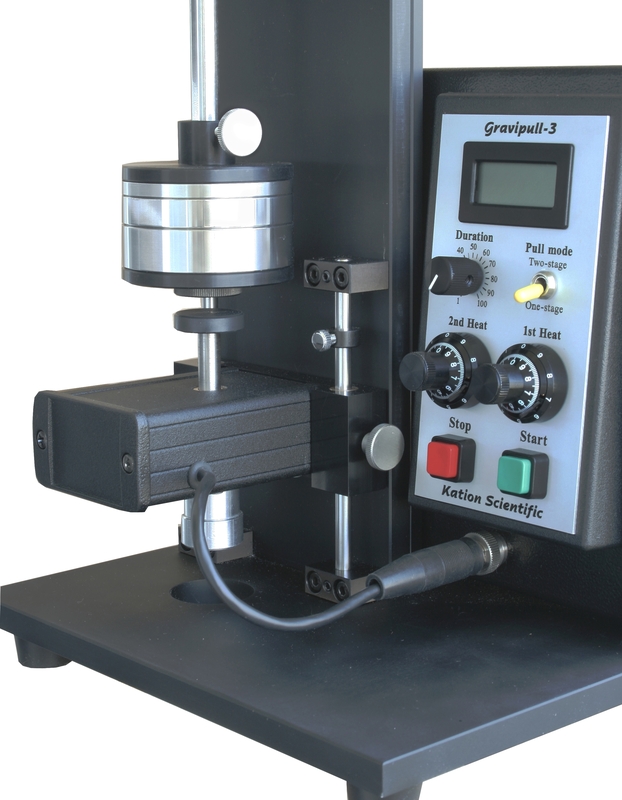 The Gravipull-3 is designed to pull multi-barrel glass micropipette assemblies or single-barrel glass micropipettes. It is intended to soften and pull borosilicate glass capillary tubing constructions (‘blanks’) up to 0.25" (6.4 mm) in diameter and 6" (152 mm) long. The pull is fed by gravity using a 7-stage weight system. 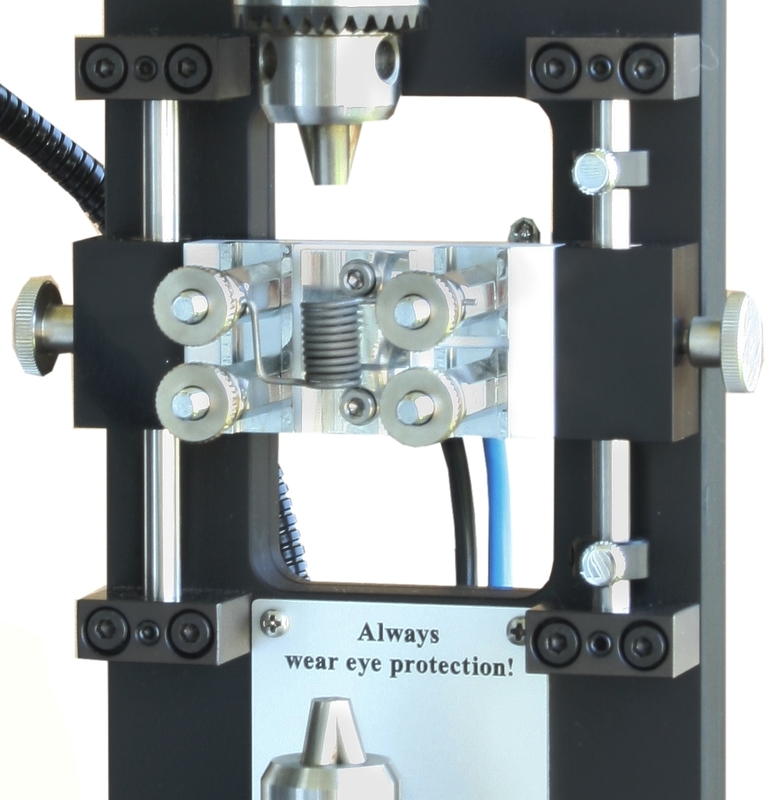 The chuck mounted on the lower sliding shaft can be rotated and it is pulled by the weights once the glass begins to soften. A bumper in the bottom of the puller arrests the lower glass holder gently so as not to damage the lower piece of glass. 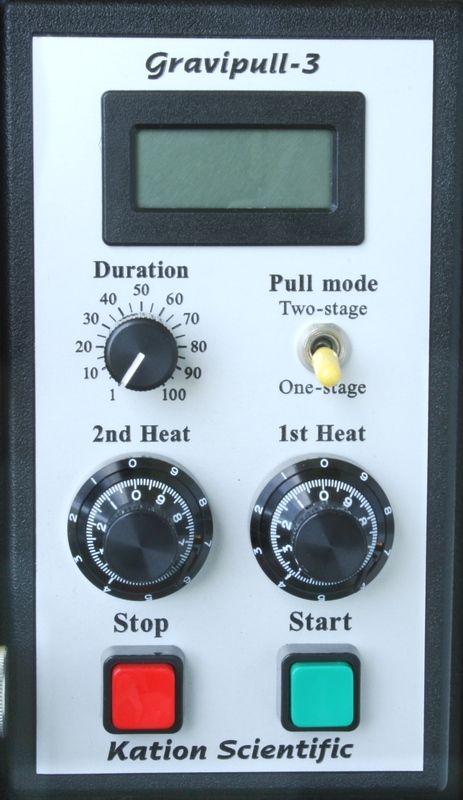 A truly unique feature of the Gravipull-3 is the capability of pulling micropipettes in two stages using two separate heater coils and an exceptional latch mechanism. For greater flexibility, the heater coils and the bumper/latch system are mounted on two carriages allowing vertical adjustments. Adjustable shaft collars allow reproduction of the same pull sizes in repetition with ease. Altogether, this system permits producing taper (shank) lengths up to about 100 mm. A sample two-stage pull of a three-barreled micropipette assembly is shown on the left. This long-tapered version of our Carbostar-3 microelectrode is intended for reaching deep brain structures in large-bodied animals. A video on how to use this puller is shown here. Slider’s travel: 4.4" (112 mm) vertical, the longest in its class! 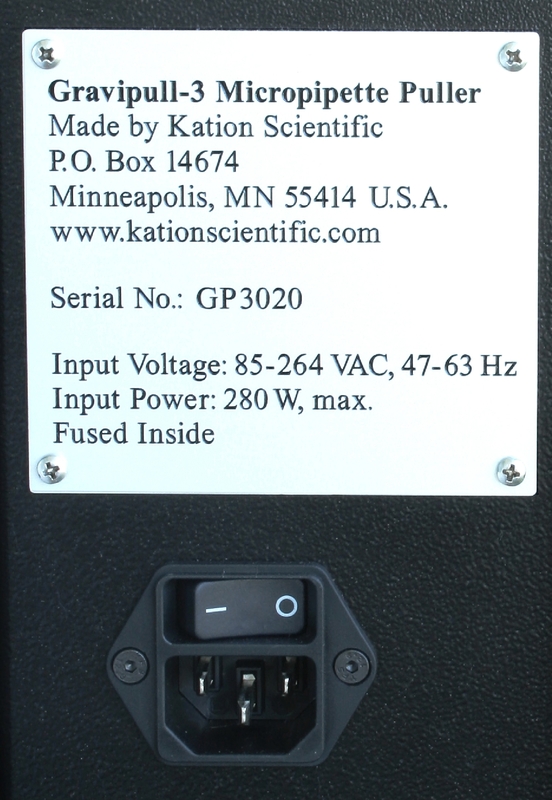 Mains power input: World-wide automatic, self-adjusting: from 85 to 265 VAC, 280 W, max. All of our micropipettes are made using a puller like this! Sold complete with user guide, 10' (3 m) Khantal AF heater wire and one of the selected power cord: US, European, UK, Australian. Covered by one year limited warranty and free technical e-mail help. 30-day money back guarantee for customers in the US and the European Union.